33+ Dead. 100+ wounded. Many children among the victims. KABUL, Afghanistan — A rush-hour suicide bombing Saturday in a busy section of Jalalabad in eastern Afghanistan killed at least 33 people and injured more than 100. 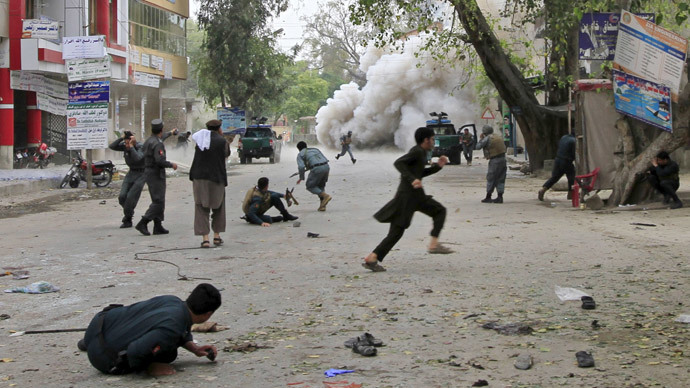 A motorcyclist detonated his explosives about 8 a.m. in the midst of a crowd in front of the New Kabul Bank, said Gen. Fazal Ahmad Sherzad, the police chief for Nangarhar province. The bank attracts government workers collecting their paychecks. Sherzad said that most of the victims were civilians and that children were among the casualties. How odd it would be if there suddenly was no Islamic carnage in the world.